Welcome to the new kid on the f+f block: the flower club! then bundling them all up and delivering them straight to your door on the first Wednesday of every month! WHAT IS F + F FLOWER CLUB AND HOW DOES IT WORK? Glad you asked! The premise is pretty straight forward. It’s a club for people who really love having fresh and unique flowers in their home on a regular basis. 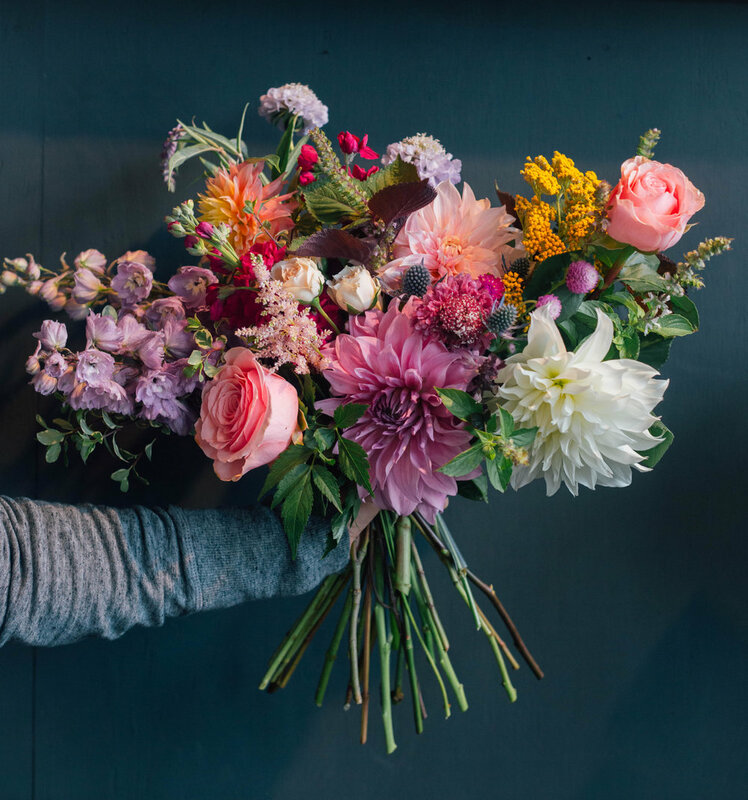 We hand wrap a bouquet of the fanciest and most seasonal F+ F flowers once a month; on the first Wednesday of the month. You can choose to pick them up at the shop (free of charge) or have them delivered straight to your door (small additional fee) on the first Wednesday of the month. To get monthly flowers, order between the 1st - 15th of the month; after the 15th your flowers will be delivered the following month. There's no contract so you can cancel at any time, as long as you give us a two week head's up. We arrange the hand wrapped bouquets in a way that makes it easy for you to trim to your desired height and drop straight into your vessel of choice OR you can split up the bouquet to fill multiple vessels around your home. We deliver to zip codes 42001 + 42003. WHAT KIND OF FLOWERS WILL I RECEIVE IN MY HAND WRAPPED BOUQUET? F + F hand-wrapped bouquets are a selected variety of the fanciest, freshest, most unique and seasonal flowers we course from local and national flower farmers. HOW DO I TAKE THE BEST CARE OF MY FLOWERS? Your flowers will come to you lovingly hand wrapped in kraft paper. All you'll need to do is give them a fresh diagonal cut with kitchen scissors. Tip: add a drop of bleach to the vessel water to prevent bacteria growth and extend the life of the florals. HOW MANY STEMS COME IN A HAND WRAPPED BOUQUET? The specific number of stems will vary each month depending on the variety, shape, sizes and price of the florals. There will always be enough to fill a lovely vessel of your choice! 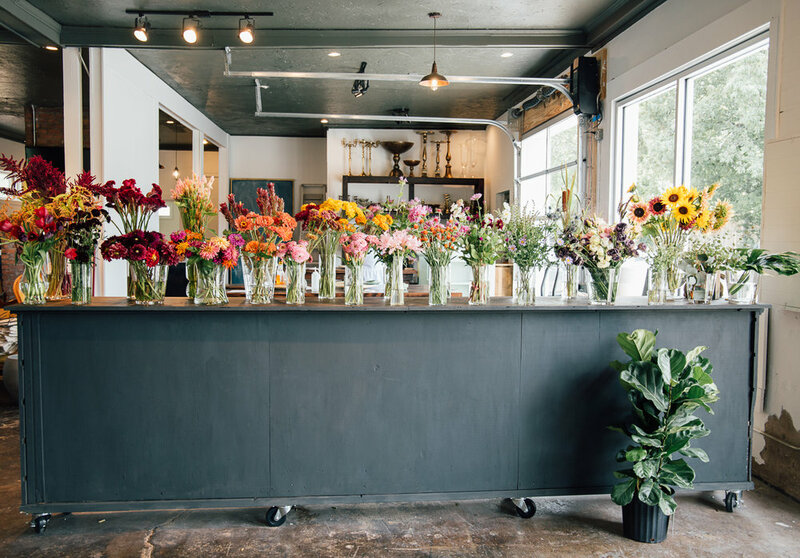 Our flowers are sourced from local and national farmers that take pride in growing beautiful, high quality florals. By supporting our local farmers we are able to offer you seasonal florals at their peek! WHAT IF I'M NOT HOME TO RECEIVE MY FLOWERS? On your first delivery we'll deliver your flowers in a glass cylinder vessel. You'll keep that cylinder and put it out on delivery days (first Wednesday of the month) with water in it so your florals can stay hydrated while they wait for you to come home. Just let us know by calling us at 270.538.9067. And enjoy your time away! CAN YOU DELIVER MY FLOWERS TO MY OFFICE? Of course! Just enter the address (within zip code 42001 + 42003) you want your hand-wrapped bouquet sent to each month and we will be happy to deliver them there. Call us! Our number is 270.538.9067.